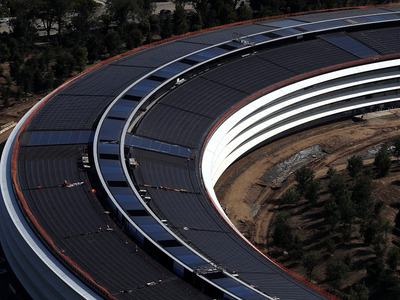 Justin Sullivan/Getty ImagesApple’s new circular headquarters at Apple Park. Employees keep walking into the glass walls and doors at Apple’s new “spaceship” headquarters in California, which opened in January. Apple’s campus cost $US5 billion and its construction was spearheaded by design chief Jony Ive. The company removed Post-It notes left by employees to mark out the glass doors and walls, claiming they detracted from the building’s design. Apple employees have had to make at least three emergency services calls since moving into the company’s new “spaceship” campus in Cupertino, California. Apple Park is Apple’s new headquarters and has been open since January. It can house thousands of employees, and mainly comprises a futuristic, circular building that is made almost entirely from glass. The campus cost $US5 billion (£3.6 billion) and its construction was headed up by Apple’s design chief Jony Ive. Reports emerged over the last month that employees who have moved into the new building have one major issue: They can’t see where the glass doors and walls are and keep walking into them. They have tried to get around the issue by marking walls with Post-It notes, but Apple removed the bits of paper and claimed they detracted from the building’s design.